JCPenney has a great new $10 off $25 JCPenney coupon out, this coupon is only valid for two days. This $10 off $25 JCPenney coupon is valid Tuesday November 15th - Wednesday November 16th. If you cannot make it to the store, you can use the JCPenney Coupon Code HUGENESS online and this code should get you free shipping to store as well. You can use the printable $10 off JCPenney Coupon in store today and tomorrow November 15th and 16th. 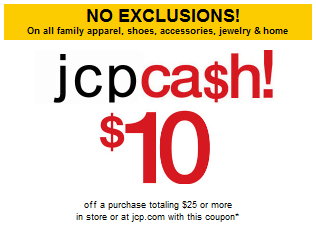 To get this JCP coupon on your phone: Text COUPON to JCP365 (527365). A special thanks to JR from Frugality is Free for sharing this great coupon deal. I've printed it and am headed to JCP to purchase my son a new pair of snow boots!